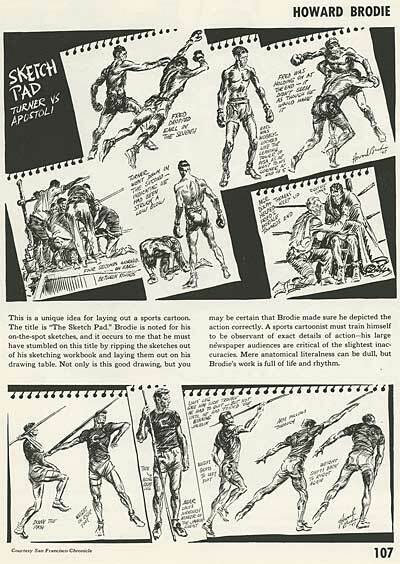 We continue with the section on two column panel and sports cartoonists from Gene Byrnes’ Complete Guide To Cartooning (1950). 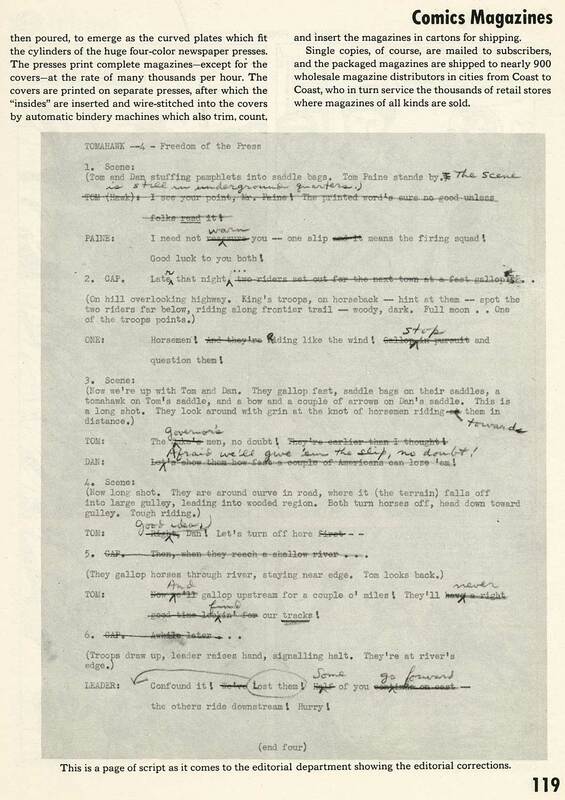 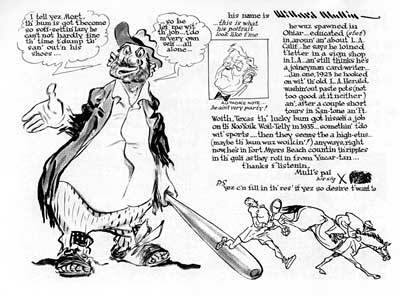 Here are step by step descriptions of the creation of panel cartoons by George Clark and Lichty; as well as an article on Robert L. Ripley and features on sports cartoonists Pap, Howard Brodie and the great Willard Mullen. 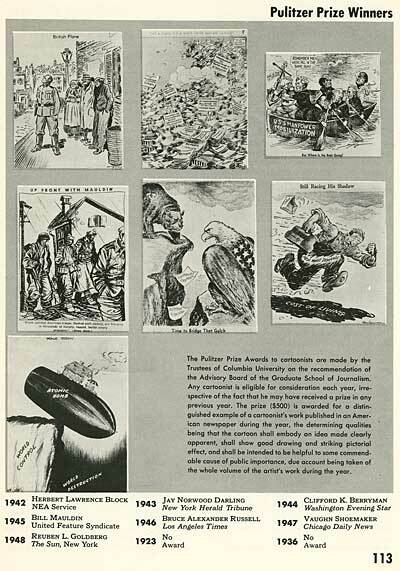 Following that is a gallery of Pulitzer Prize winning editorial cartoons, features on C. D. Batchelor and Bill Crawford, and a cursory look at how comic books were edited. 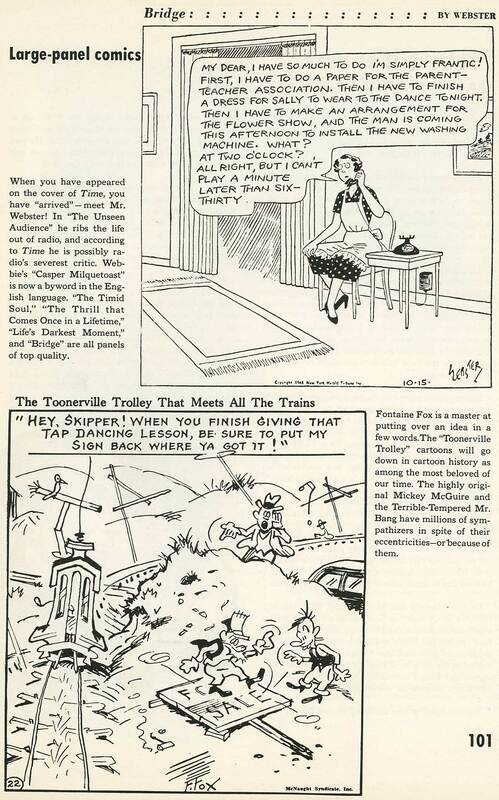 Two column panel cartoons are a staple of newspaper comics today, even though the width of the standard column has shrunk. As the size decreased, artists were forced to reduce detail. Daily strips are so small now, it’s hard to do anything wider than a medium closeup in every panel. The two column panel cartoon has become the last bastion of cartoons with any kind of detail at all. 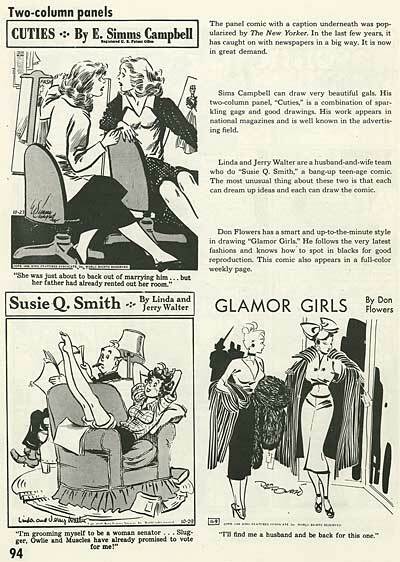 Here, Gene Byrnes covers a few of the most popular single panel comics from the late 40s. 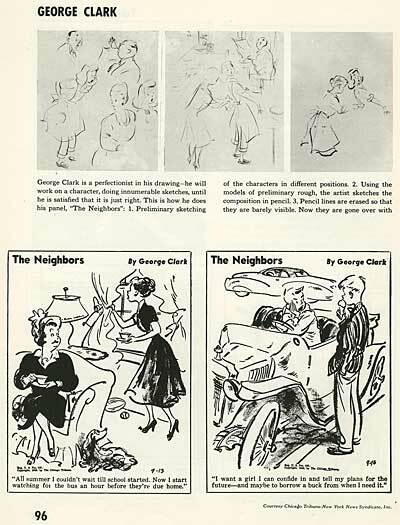 George Clark was born in Oklahoma. 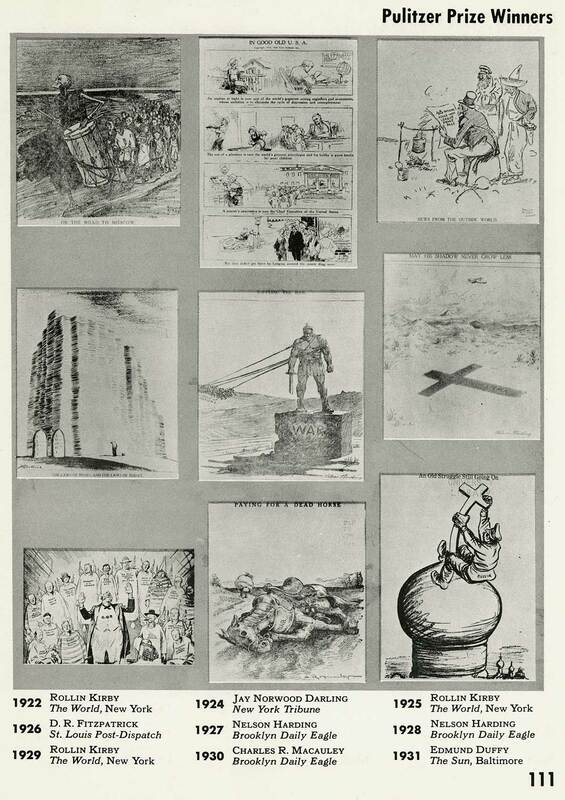 He began drawing at a very young age, and by 16 years old, his cartoons were appearing in the Daily Oklahoman. 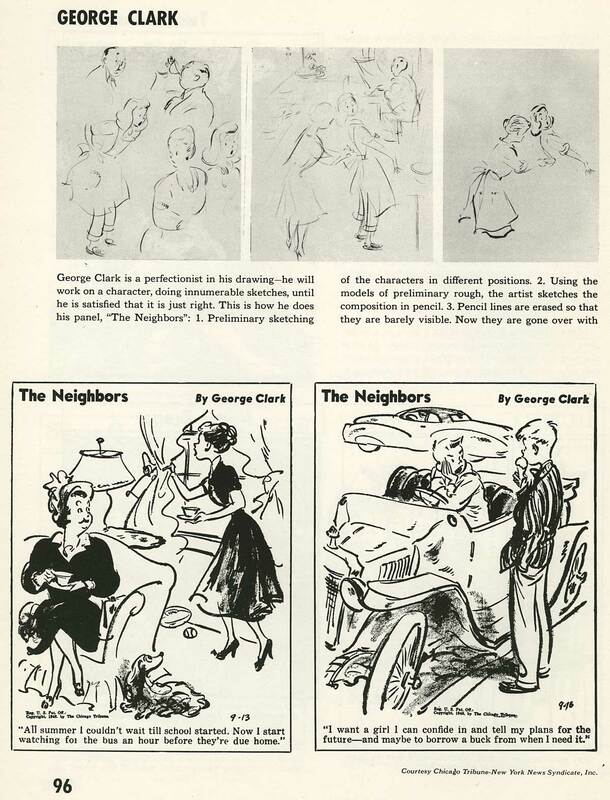 His first syndicated cartoon was "Side Glances", and in 1939, he created the one panel comic he is best known for, "The Neighbors". Clark’s gags were inspired by quiet observation of people in soda fountains and railroad stations. He would photograph situations, street scenes and expressions to incorporate into his drawings. The family in the comic was loosely based on his own wife and children. He would create all of his comics for a week in one marathon session. He wrote, "It takes me at least six hours to warm up. 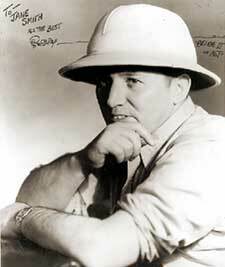 I sit there trying to work and wondering what I’ve been doing all these years that it should still come so hard to me." When the ideas started flowing, he would work nonstop for up to 12 hours straight to complete the six cartoons for the week. 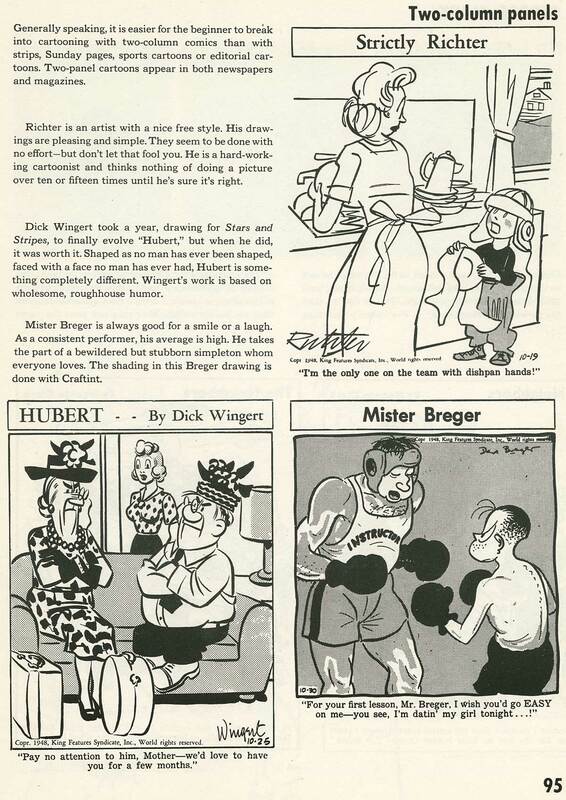 He commented on the grueling process by saying, "When I’m trying to think of ideas for cartoons and they won’t come, I think it would be wonderful to paint landscapes, with no gags in them." 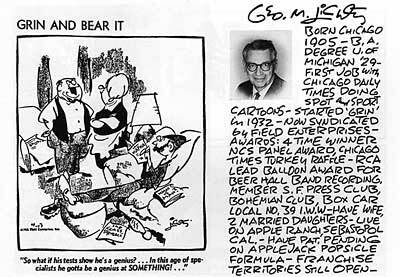 George Lichty was one of the most famous and highly paid one panel cartoonists in the newspapers. 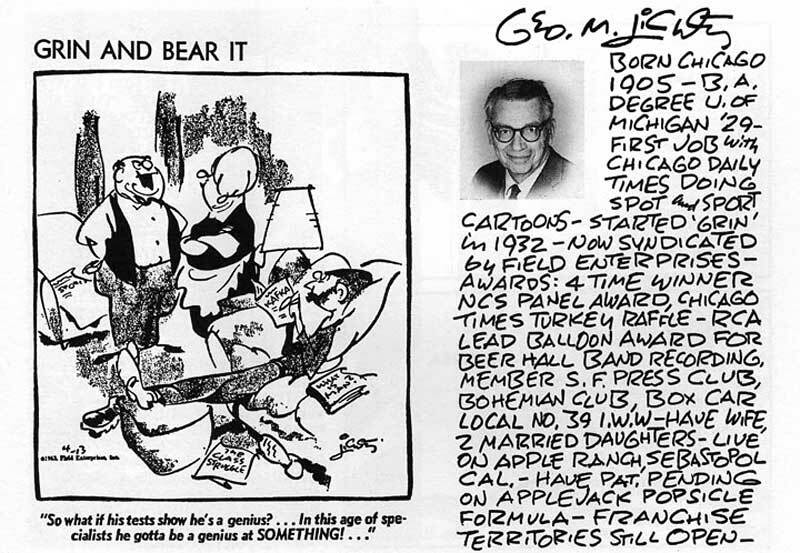 He created the cartoon, "Grin And Bear It" in 1932, and it ran every day for many decades. 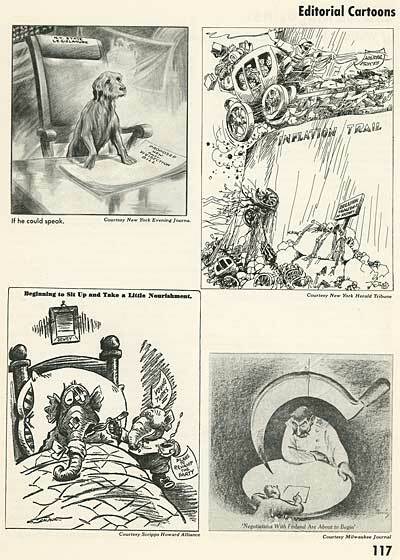 When asked to what he attributed the popularity of his wonderful lummoxes with names like "Bascomb Belchmore" and "Senator Snort", he replied, "From little acorns mighty oafs grow." When newspaper comics were at their zenith, whole pages were sometimes devoted to a single comic. 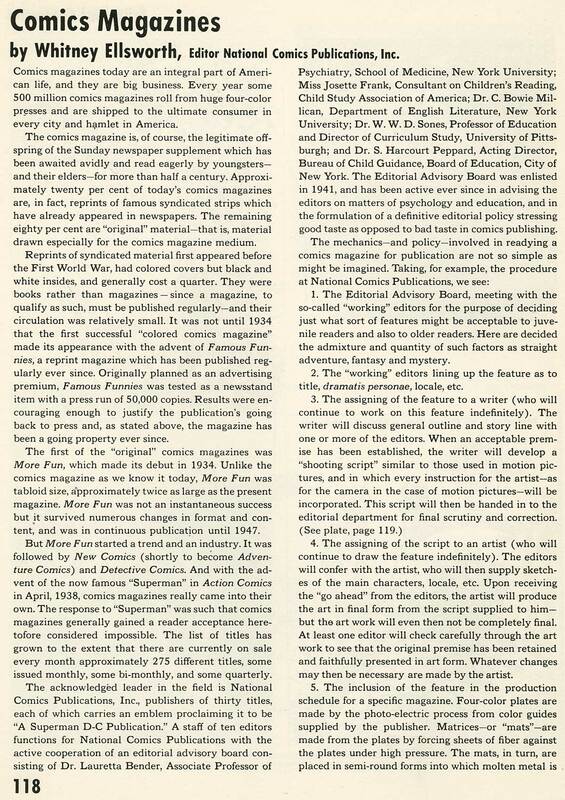 Other comics would be half pages. Interspersed throughout the comics pages were quarter and third page single panels that depicted scenes and panoramas filled with gags. 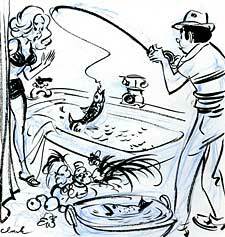 Today, each comic is so small, it’s lucky if it can put across a single gag. 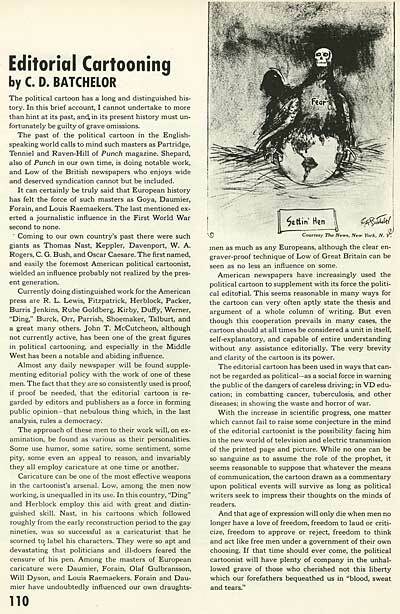 A lot of the richness and depth of view has been lost. 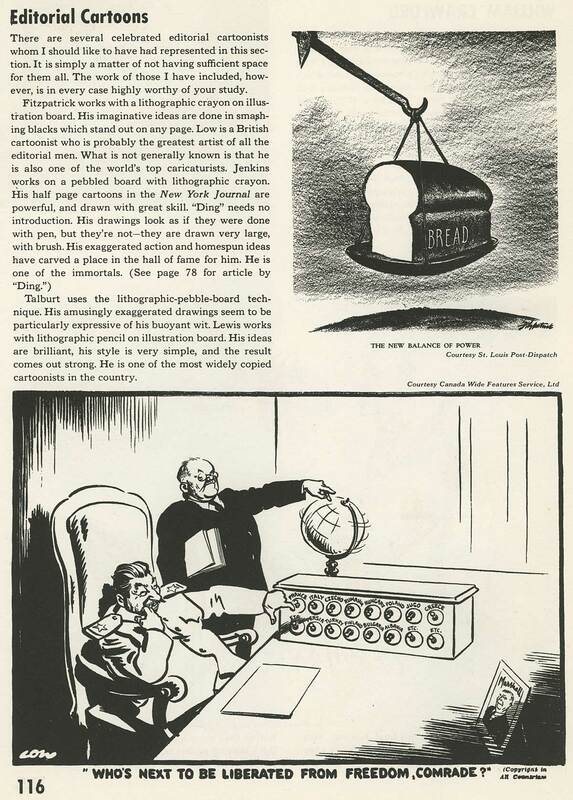 Robert Ripley was unique among cartoonists, because he truly lived his strip. 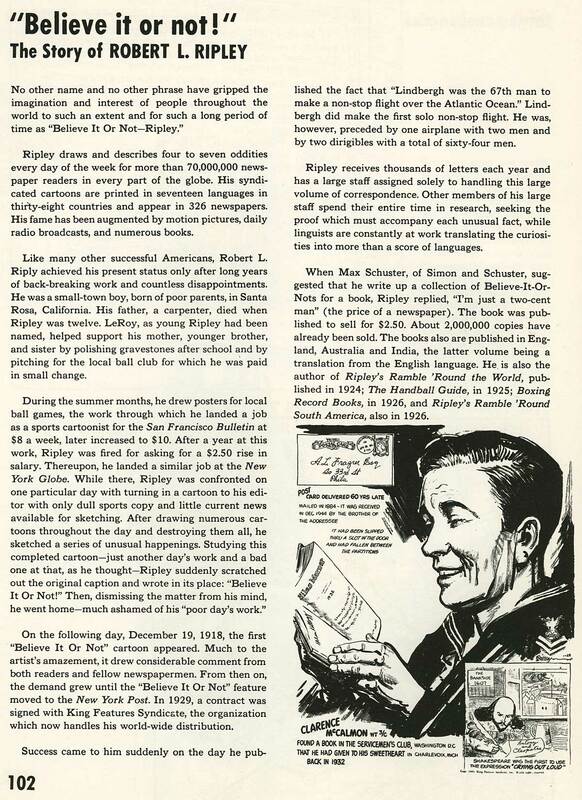 Ripley travelled the world in search of the odd and unusual, which he featured in his daily newspaper comic. He passed away in 1949 at 56 years of age. 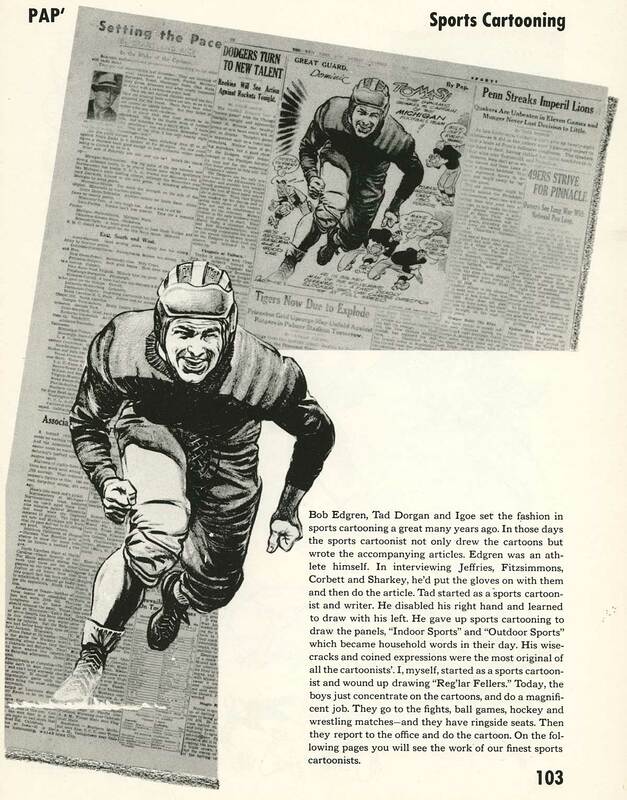 Thomas "Pap" Paprocki was referred to as the "Rembrandt of the sports pages". Born in 1902, he began his artistic endeavors at age nine, when he took painting lessons from an artist near his home in New York. 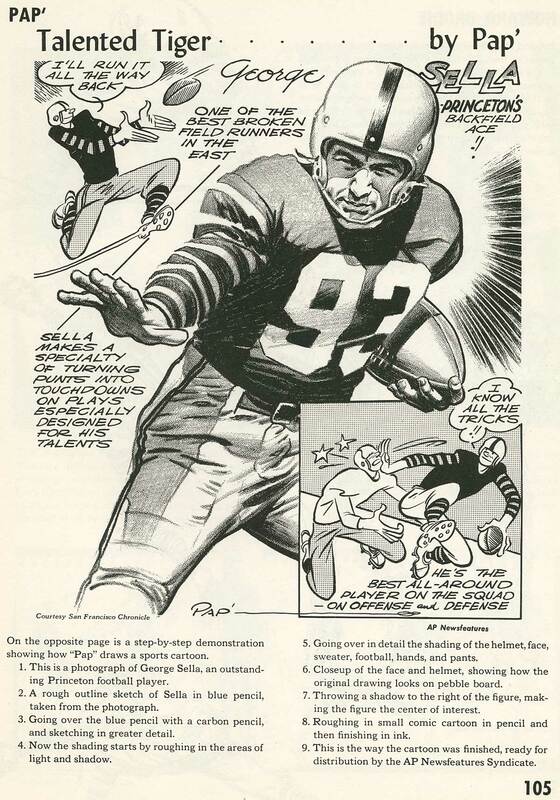 A gifted athelete, it was natural that he would gravitate to being a sports cartoonist. 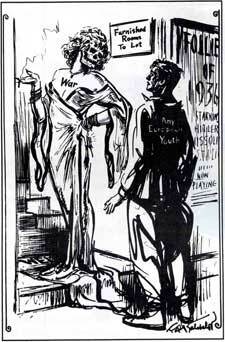 In 1932, he began working for the Associated Press, where his column and drawings ran for over three decades. 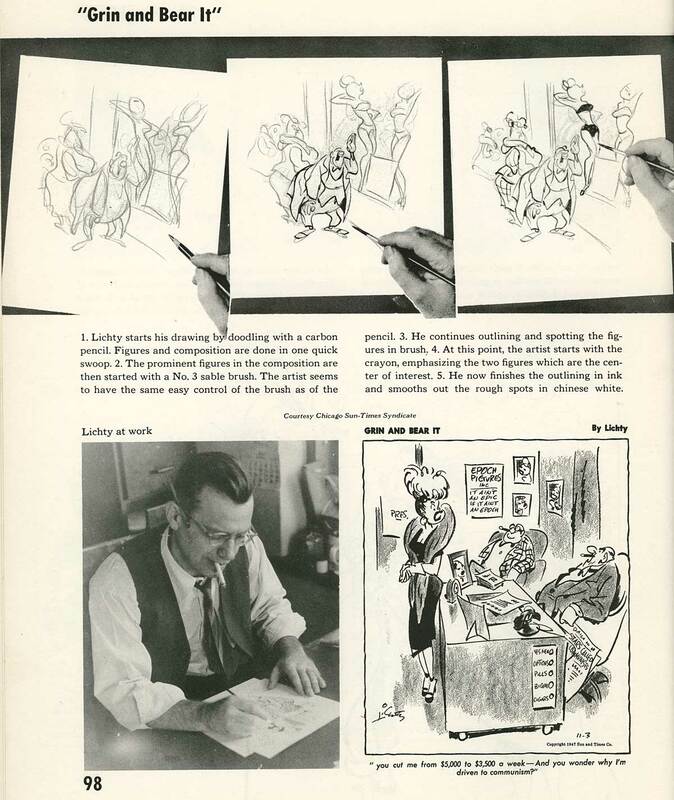 Check out the meticulous planning he put into his work. 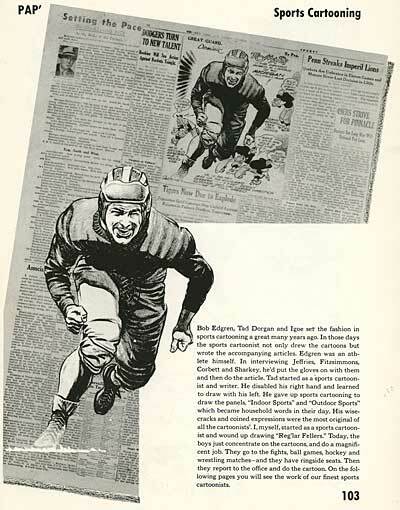 Howard Brodie worked as a sports cartoonist for the San Francisco Chronicle. 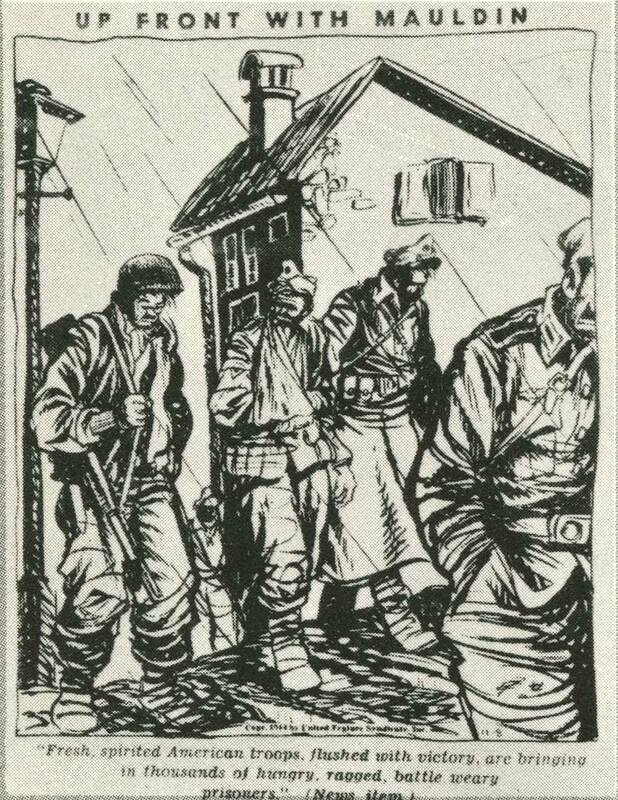 During WWII, he became a combat correspondent, creating illustrations of GIs in action that made a huge impact on readers stateside. 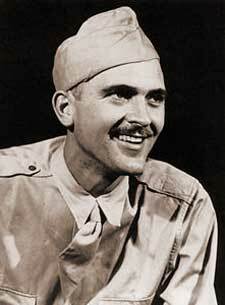 He was a decorated veteran, and also served as a combat artist in Korea and Viet Nam. 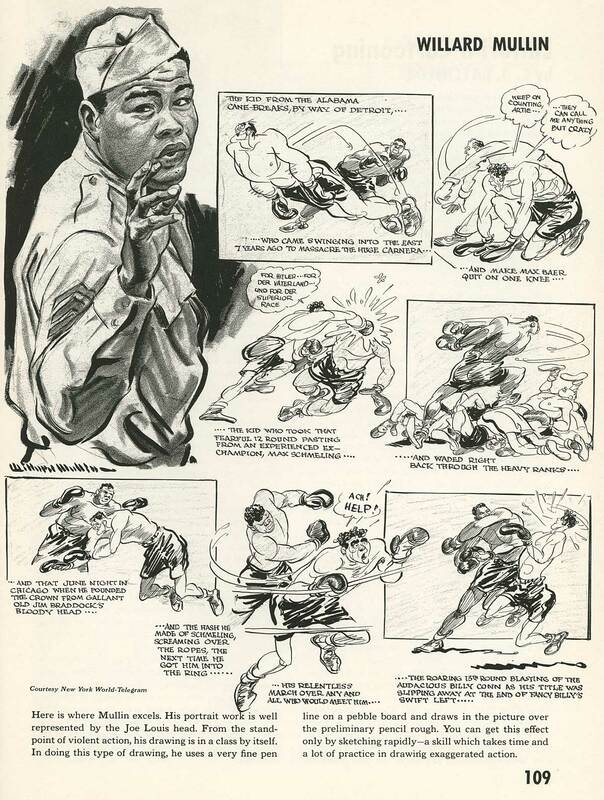 In the 50s and 60s became a courtroom artist, famous for his ability to capture the drama and detail of the proceedings in his quick powerful sketches. 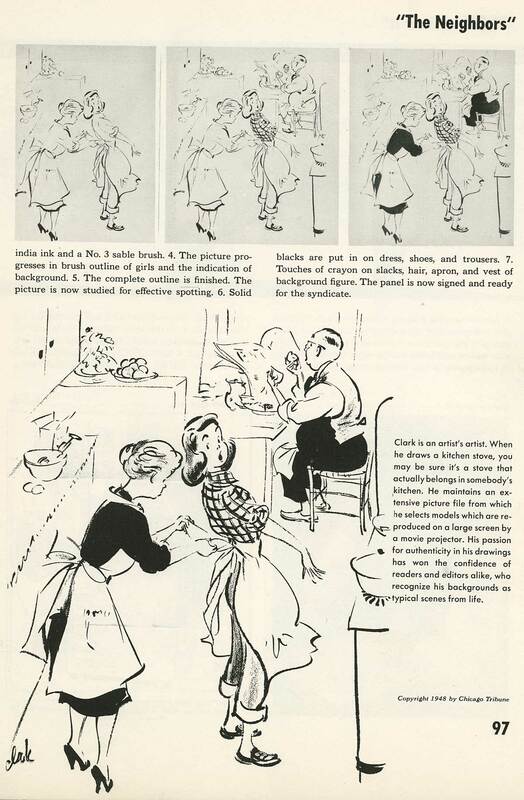 Willard Mullin has been featured in this blog before in reference to his work on the Famous Artists Cartooning Course. 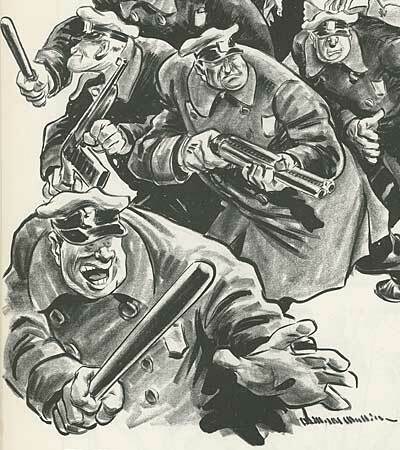 He grew up in Los Angeles, but like most newspaper cartoonists of his era, he moved to New York in 1934. 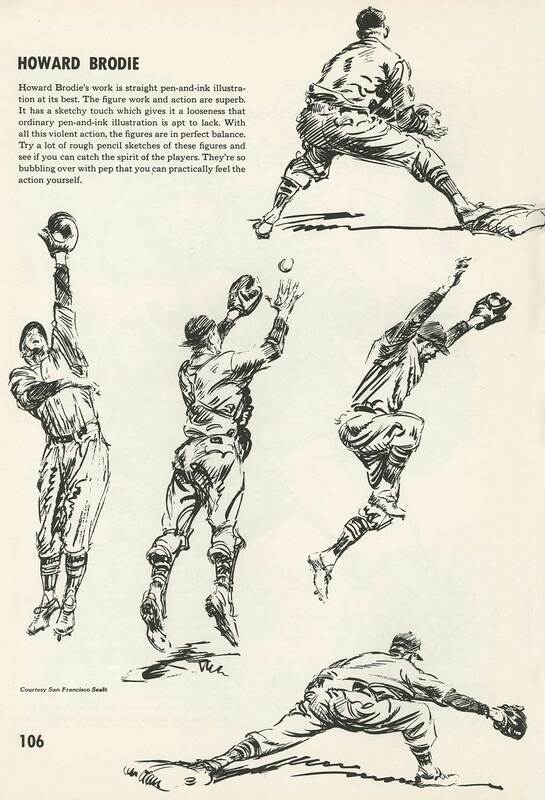 He worked for the New York World Telegram for over thirty years, where he created the iconic caricature of the Brooklyn Dodgers, the "Brooklyn Bum". 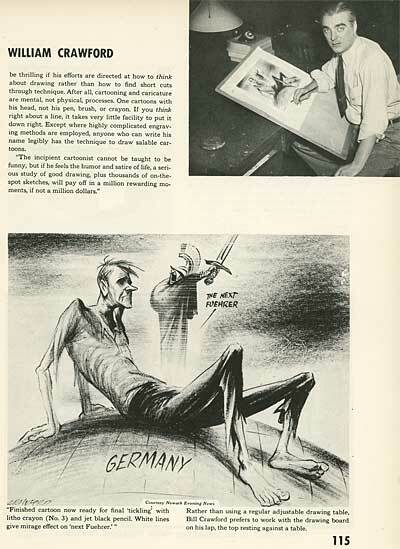 Mullin eventually became a respected illustrator for Time, Life, and The Saturday Evening Post. 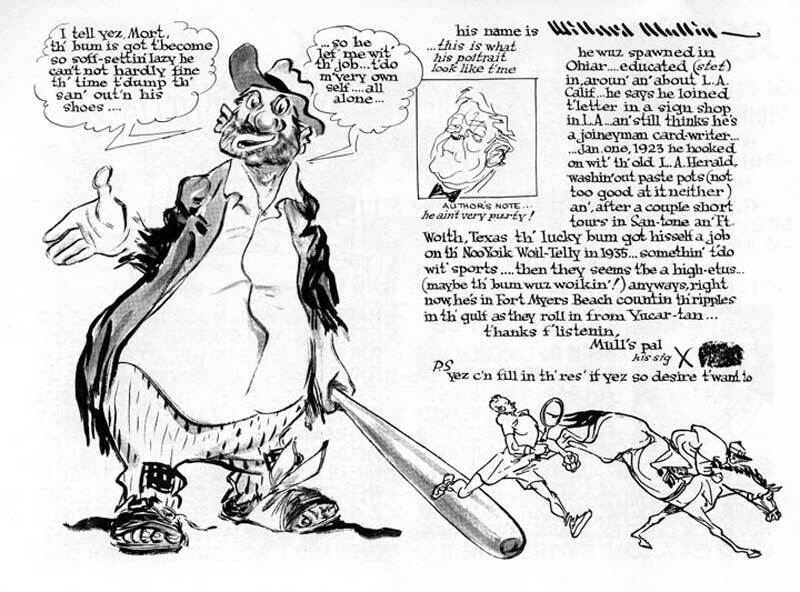 Although sports cartooning is pretty much a dead artform, Mullin’s work is timeless and will live on long after the game has ended. 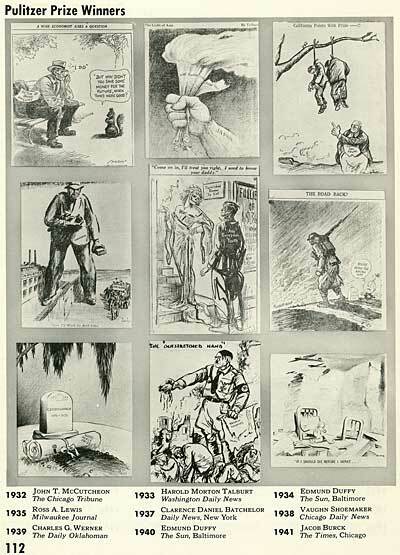 Clarence Daniel Batchelor started as a staff cartoonist at the Kansas City Star. 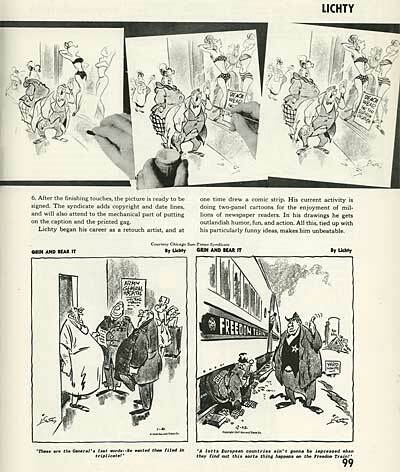 He worked as a freelance illustrator for a time before joining the New York Daily News in 1931. 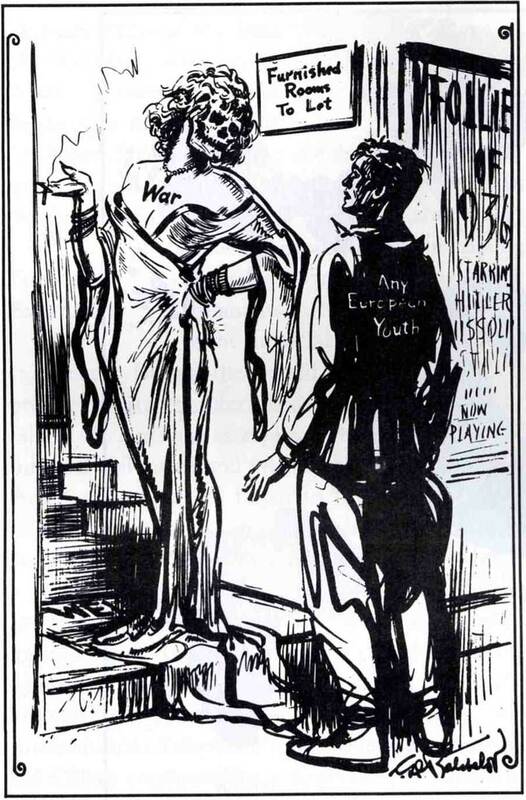 He worked there for 38 years as an editorial cartoonist, He won the Pulitzer Prize in 1937 for the accompanying cartoon of a young man labelled "Any European Youth" being propositioned by a skull faced whore representing war, captioned… "Come on in, I’ll treat you right! 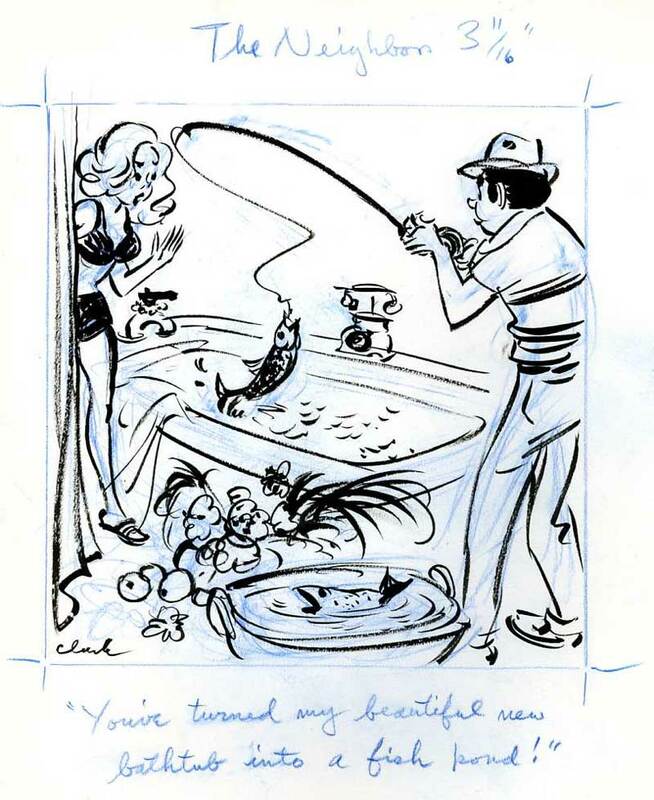 I used to know your Daddy." 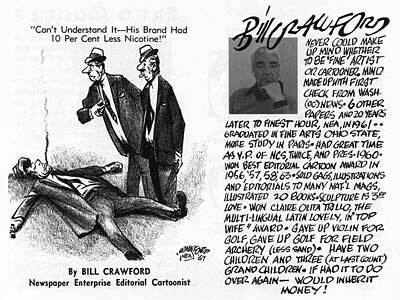 As I went to Google to research this blurb on editorial cartoonist Bill Crawford was a master of the medium. 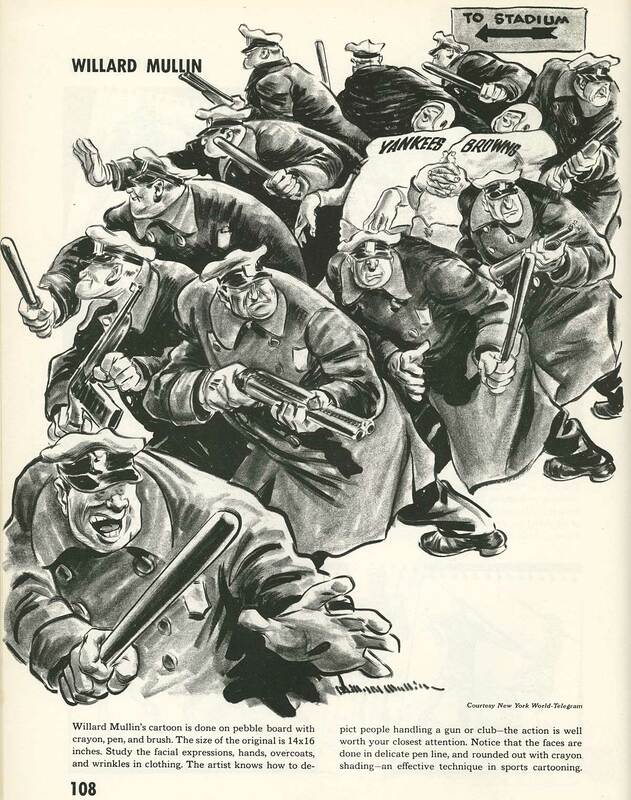 He was awarded the National Cartoonists Society awards for best editorial cartoon of 1956, 1957, 1958 and 1966; he was awarded the Silver T-Square Award in 1977; and he served as president of the organization in 1960. 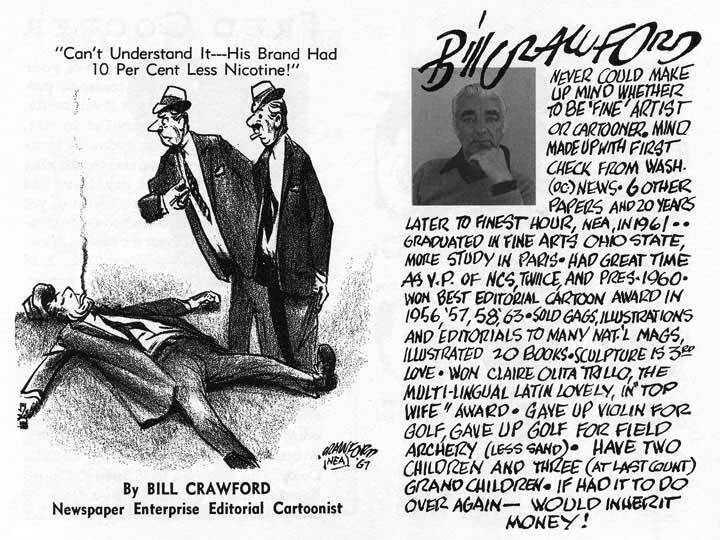 His cartoons first appeared in the Newark News, and later were syndicated to over 700 newspapers around the country. 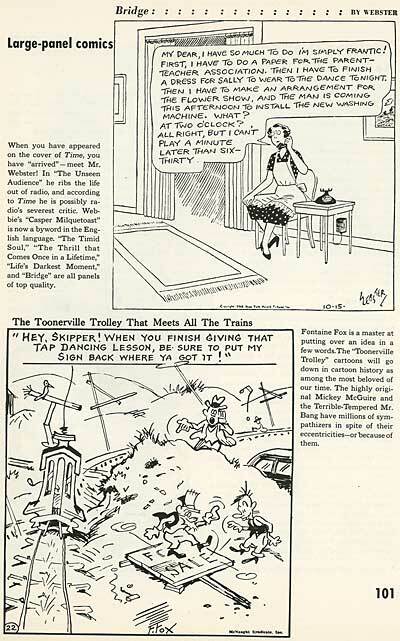 Whitney Ellsworth started out as an assistant artist at King Features, working on strips like Dumb Dora and Tilly the Toiler. He was chief editor at DC Comics during the golden age of Superman, Batman, The Spectre, and The Green Arrow- but Superman was the series he was most closely involved in. 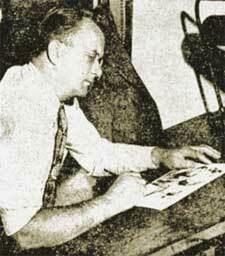 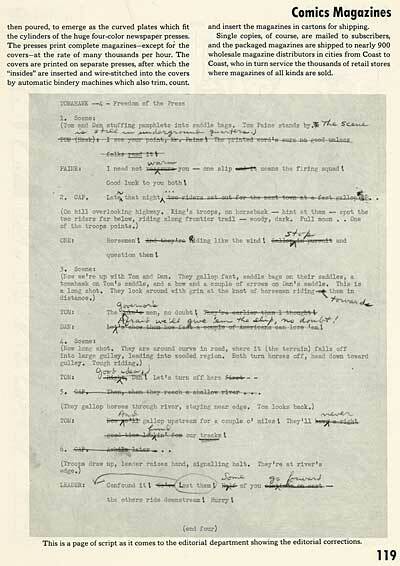 Ellsworth wrote many of the story outlines for the comic books, and in the early 50s, he wrote the pilot episode of the Superman TV serial, Superman Meets The Mole Men. 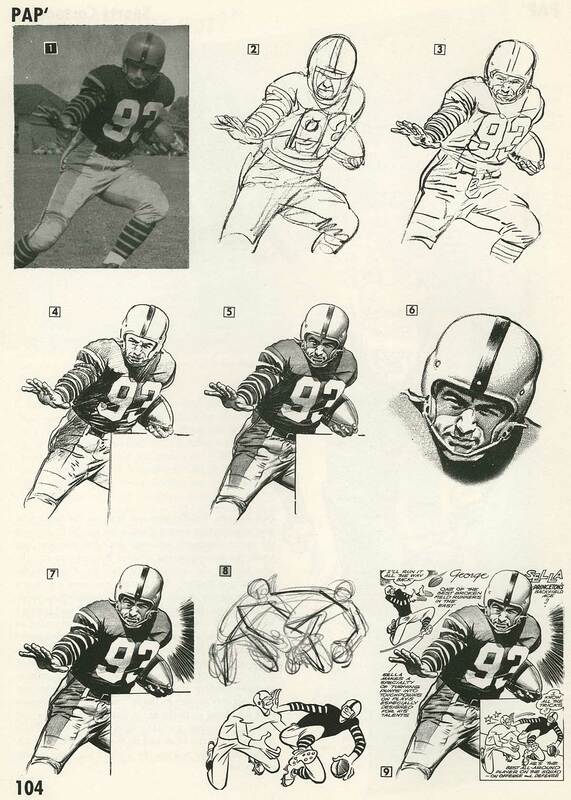 He retired in 1970. It’s interesting to compare the editorial script to the finished artwork provided here. 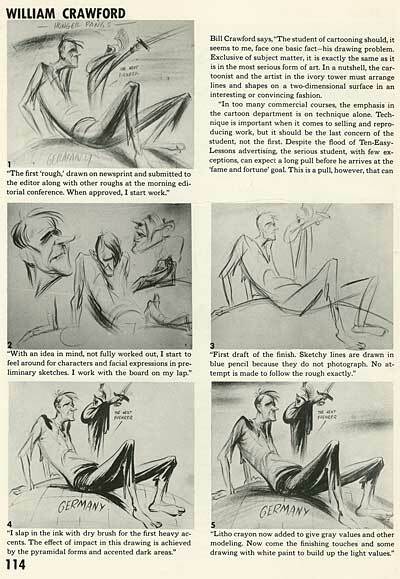 The only thing the artist used was the basic situations, a few details and the dialogue. 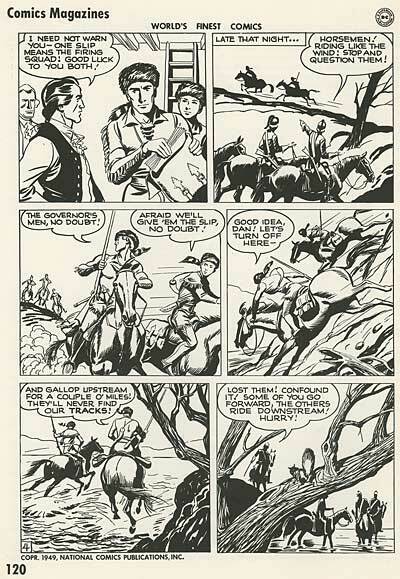 The staging of the panels and the pacing of the action from panel to panel had to be completely reworked to function visually. 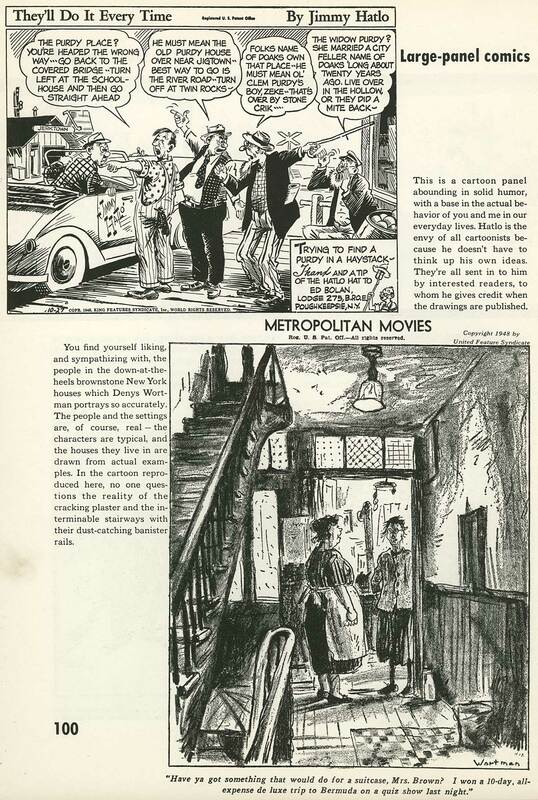 It’s surprising that Byrnes gives this section on comic books such short shrift. 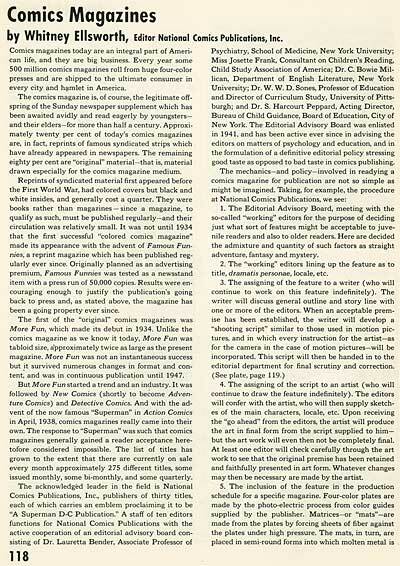 Ellsworth focuses on the technical and editorial aspects of the comic book business, and barely mentions the artists who actually create them. Perhaps if Byrnes had gotten Joe Shuster, Bob Kane or Jack Kirby to write this section, it would have been a different story. This entry was posted on Monday, December 11th, 2017 at 1:39 PM	and is filed under cartooning, cartoonist, cartoons, comic strips, comics, Complete Guide To Cartooning, editorial cartoons, education, george clark, howard brodie, instruction, lichty, pap, robert ripley, sports.